The new Pew Research Center survey of U.S. Catholics provides an opportunity to take stock of Americans’ Catholic identity – not just people who identify primarily as Catholics, but the entire spectrum of those whose lives have crossed paths with the Catholic Church in a meaningful way. 9% are “cultural Catholics”: Nearly one-in-ten U.S. adults say that their religion is not Catholic (most are Protestants or are unaffiliated with any religion), but also say they consider themselves Catholic or partially Catholic in some other way. These cultural Catholics most often say they were raised Catholic or had a Catholic parent and still think of themselves as Catholic in terms of ancestry or family tradition. While categorizing such a large number of people in such a way is imperfect, these groups show the wide influence of Catholicism in American society. This influence is even greater among Hispanics. 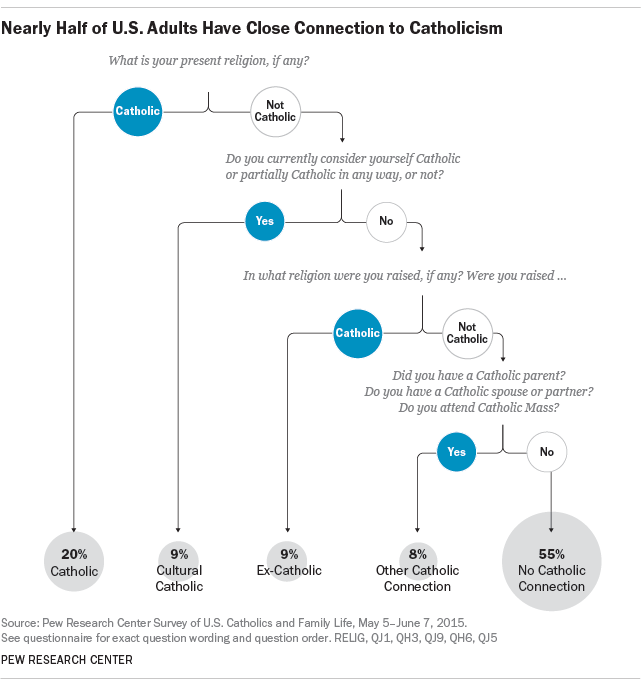 For instance, more than eight-in-ten Hispanic adults in the U.S. (84%) have one of these types of connections to Catholicism, including 45% who are Catholics, 13% who are cultural Catholics, 18% who are ex-Catholics and 8% who are otherwise connected to the church. Looking at Americans of all races and ethnicities, there are, of course, major differences between the four Catholic-connected groups. For example, Catholics are by far the most likely to attend Mass at least sometimes: 95% say they do. Cultural Catholics are considerably more likely than ex-Catholics to report ever attending Mass (47% vs. 17%). There are similar splits among these three groups when it comes to other Catholic practices, such as giving up something for Lent or expressing a desire to receive the anointing of the sick (sometimes part of “last rites”) in a case of serious illness. In both of these cases, Catholics are most likely to partake, while cultural Catholics express moderate levels of participation and ex-Catholics appear more firmly disconnected from the church. This dynamic holds true as well when it comes to the question of whether people could see themselves returning to the Catholic Church. Among cultural Catholics who were raised Catholic, 43% say they could see themselves returning to Catholicism someday. But just 8% of ex-Catholics say the same. While Catholicism may have affected their upbringing, these people say they have largely left the Catholic Church behind for good.